The Speaker of the National Assembly of the Republic of Serbia Maja Gojkovic convened the Fourth Sitting of the Second Regular Session of the National Assembly of the Republic of Serbia in 2018, for Tuesday, 27 November 2018, starting at 10 am. Before commencing the proceedings, the heads i.e. authorised representatives of the parliamentary groups, MPs Prof. Dr Vojislav Seselj, Jovan Jovanovic, Miroslav Aleksic, Dr Muamer Bacevac, Nada Lazic, Djordje Vukadinovic, Haji Milorad Stosic, Bosko Obradovic, Tatjana Macura, Balsa Bozovic, Marijan Risticevic and Aleksandar Markovic requested information and explanations in line with article 287 of the National Assembly Rules of Procedure. Based on the Report of the Committee on Administrative, Budgetary, Mandate and Immunity Issues, the National Assembly noted the termination of the term of office of MPs Dusan Pavlovic, MA Jasmina Nikolic and Dr Ratko Jankov, before the expiry of the term they were elected for. Proposal of the Decision to Grant Consent to the Energy Agency of the Republic of Serbia 2019 Financial Plan, submitted by the Committee on Finance, State Budget and Control of Public Spending. The National Assembly accepted the proposal of MP Aleksandar Markovic to complete a joint debate in principle and single debate on all the items on the agenda. On the second day of the proceedings, 29 November, the National Assembly commenced the joint debate in principle and single debate on items 1 – 62 on the agenda. The bills were presented by Minister of Finance Sinisa Mali, Minister of Education, Science and Technological Development Mladen Sarcevic, Minister of Public Administration and Local Self-Government Branko Ruzic, National Assembly Speaker Maja Gojkovic, Minister of Mining and Energy Aleksandar Antic and member of the State Prosecutorial Council Sandra Kulezic, as representatives of the submitter. The MPs conducted the joint debate in principle and single debate on all the items on the agenda for the remainder of the day. On the third day of the proceedings, 29 November, before moving on to the agenda, the heads i.e. authorised representatives of the parliamentary groups, MPs Vladimir Djuric, Slavisa Ristic, Miroslav Aleksic, Enis Imamovic, Milija Miletic, Aleksandar Seselj, Bosko Obradovic, Radoslav Milojicic, Dr Boban Birmancevic and Dr Muamer Bacevac requested information and explanations in line with article 287 of the National Assembly Rules of Procedure. For the remainder of the day the National Assembly conducted the joint debate in principle and single debate on items 1 to 62 on the agenda. On the fourth day of the proceedings, 30 November, the MPs conducted and by the end of the day concluded the joint debate in principle and single debate on items 1 to 62 on the agenda. On the fifth day of the proceedings, 3 December, the MPs commenced and for the remainder of the day conducted a debate in detail on the Bill on Central Registry of Compulsory Social Insurance. On the sixth day of the proceedings, 4 December, before moving on to the agenda, the heads i.e. authorised representatives of the parliamentary groups, MPs Prof. Dr Vojislav Seselj, Dr Muamer Bacevac, Vladimir Djuric, Miroslav Aleksic, Djordje Vukadinovic, Cedomir Jovanovic, Balsa Bozovic, Marinika Tepic, Bosko Obradovic, Marijan Risticevic and MA Jadranka Jovanovic requested information and explanations in line with article 287 of the National Assembly Rules of Procedure. The MPs continued and for the remainder of the day conducted the debate in detail on the Bill on Central Registry of Compulsory Social Insurance. On the seventh day of the proceedings, 5 December, the MPs continued and for the remainder of the day conducted the debate in detail on the Bill on Central Registry of Compulsory Social Insurance. On the eighth day of the proceedings, 6 December, before moving on to the agenda, the heads i.e. authorised representatives of the parliamentary groups, MPs Aleksandar Seselj, Dr Milorad Mijatovic, Jovan Jovanovic, Milija Miletic, Djordje Vukadinovic, MA Ivan Kostic, Cedomir Jovanovic, Goran Ciric, Mirjana Dragas and Aleksandar Markovic requested information and explanations in line with article 287 of the National Assembly Rules of Procedure. The National Assembly continued the debate in detail on the Bill on Central Registry of Compulsory Social Insurance. By the end of the day the National Assembly had completed a debate in detail on items 1 to 62 on the agenda. As the National Assembly had completed a debate in principle and in detail on all the items on the agenda, the Chair, National Assembly Deputy Speaker Veroljub Arsic set Friday, 7 December, as Voting Day on all the items on the agenda for the Fourth Sitting of the Second Regular Session of the National Assembly of the Republic of Serbia in 2018, starting at 10 am. On Voting Day, 7 December, the MPs passed, by majority vote, items 1 to 53 on the agenda of the sitting. The MPs also adopted the Proposal of the Decision on the election of court presidents, submitted by the High Judicial Council, Proposal of the Decision on the election of judges to judicial office for the first time, submitted by the High Judicial Council, Proposal of the Decision on the termination of office of President of the Supreme Court of Cassation, submitted by the Committee on the Judiciary, Public Administration and Local Self-Government and the Proposal of the Decision on the election of Deputy Public Prosecutor, submitted by the State Prosecutorial Council. The National Assembly went on to pass items 58 to 62 on the agenda of the sitting. On Voting Day the National Assembly also ruled on the violations of the Rules of Procedure the MPs complained of in the course of the sitting and decided that none of the provisions of the Rules of Procedure had been violated. 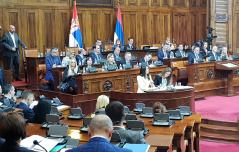 As the National Assembly had completed the debate on all the items on the agenda and ruled on them, the Chair, National Assembly Speaker Maja Gojkovic concluded the Fourth Sitting of the Second Regular Session of the National Assembly of the Republic of Serbia in 2018.